This Gladiatus Game/Beginner's guide 2018 will be targeting the newer audience but is also suitable for refreshing the knowledge on older players for some of the basic aspects of the game. The game is about you (the player) being a gladiator fighting in different countries, going on expeditions, dungeons, arenas, events and the underworld. You can train stats, find gear and improve yourself. 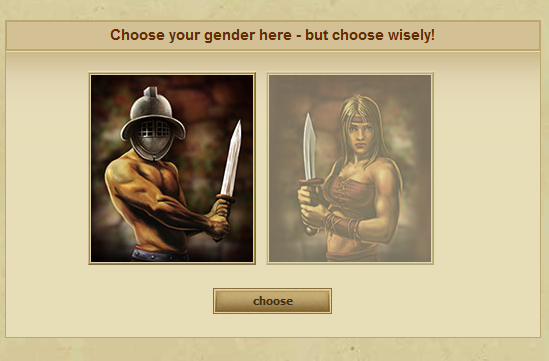 Choose a gender. Yes, choose wisely because you can change it later but definitely not right away or anytime soon. The next thing you want to do is verify your email so you can enjoy full featured game. 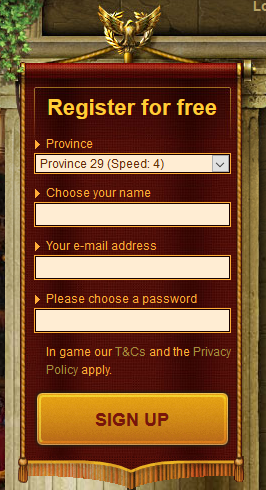 Ever since you clicked Sign Up, an email with an activation link has been sent to your registration email address. Every Victory (achievement) provides Victory points so this measures your total. Different Victories provide different Victory points. From 0 to 30. Click in-game to check them for more info. Familia is the tab where your friend list resides. 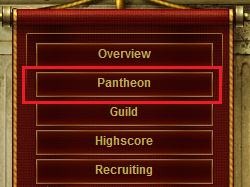 When you add someone as your friend it will appear here along with his name, guild and last online status. Quests are fundamental part of the game. Quests can be with time limit (to be done within a certain time frame) or without expiration date. These quests involve you finding items from either expeditions or dungeons. These are always the same quests but with different amount of items to find. Work Quests involve you going to work. Quests can be to go to a specific work like Stable Boy for X amount of Hours or general work like work anything for X amount of hours. Missions are one time achievements that your character can achieve and be rewarded. Rewards are in the form of God favors - . Once you complete a certain mission it will pop up on the screen and the mission will be ready to be completed with the button . You can choose to complete then at any time you want but have in mind that completing the missions will increase your total (max) favor with the gods!!! Yes, not only that they give you favor, they also raise your max so you should be completing the missions that you complete right away! The Gods system is quite a big one. 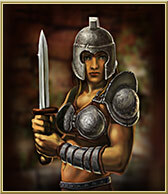 And plays a significant role in Gladiatus. There are 6 Gods - Mars, Mercury, Diana, Apollo, Minerva and Vulcan. The idea of the God system is to gather favor with the 6 gods individually and then spend this favor to activate buffs that boosts certain stats on your character. 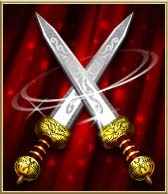 Prevents all double hits in all battles in dungeons, arenas, turma and expeditions. If you are facing an enemy that double hits you a lot, use it and you might get better odds at winning. 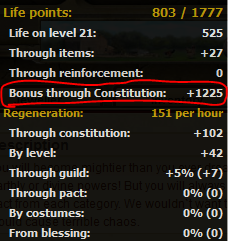 Overall, not very useful bonus. In each of these chests there are 12 possible treasures, of 3 different quality levels. Gold are the rarest, silver are uncommon and the bronze ones appear the most. But only upon opening the chest will you find out which divinely fated treasure you have received. So essentially the Chest of Divine Fate has possible winnings randomly spawning every time after you do a spin on your current chest. If you want to wait, that's not problem, the current arranged possible winnings will stay until you spin. 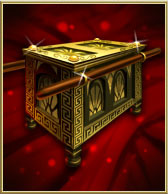 You need a Divine of Chest Fate "item" to be able to try and get one of the rewards. Normal border - Represents common items. Most of the possible winnings will spawn as normal items. Yes, Chest of Divine Fate itself can be a possible winning. If you win it, you get another chance for a roll. 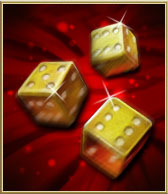 If you don't like your possible winnings, you can change them with Fortunas Die of Destiny. 1 Die re-freshes the possible winning into another set of random winnings. 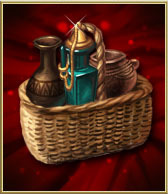 Hamper is essentially 1x Cervisia which is a special type of food which gives you 1 day of Centurion. More about it here. Hamper can only drop from Divine Chest. 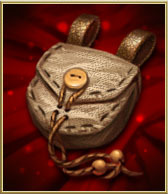 Magical bag is used to purchase extra slots of bags in your inventory. You can read more about it in the Inventory section. These cannot be bought from the Premium vendor which makes them very valuable Chest of Fate reward. Can be 1, 2 or 3 in quantity. Work Clothing is a common reward from the Chest of Fate. It is used to reduce travel time in the Hermit or reset the vendor items and cooldown. Also used in some types of Work. Reset the remaining time until new goods arrive, costs 1x . Useful when you are looking for a good Mercenary in the Mercenary vendor or when you need free space to sell your unneeded items to. Blessing Symbol provides you with 1 Blessing Pact. Seal Coins provides you with 1 Seal Pact. Commendation provides you with 1 Honours Pact. Secret Formula provides you with 1 Secret knowledge Pact. 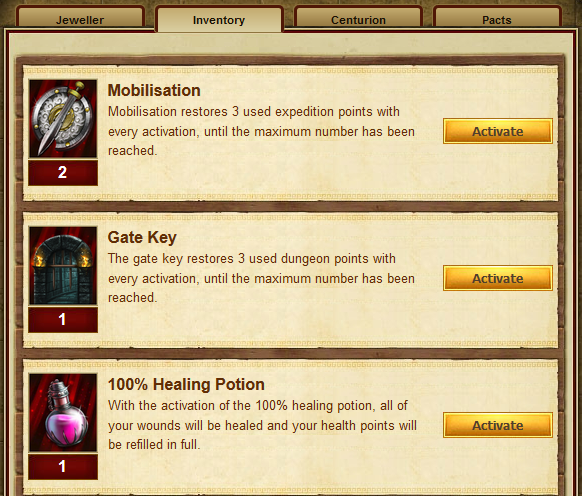 Mobilisation restores 3 used expedition points with every activation, until the maximum number has been reached. This cannot be purchased from the Premium tab and only drops from Divine Chest of Faith. Can be 1 or 3 in quantity. Also remember that Underworld is also considered an Expedition and these work in Underworld!!! If you are close to Level 100, keep them! 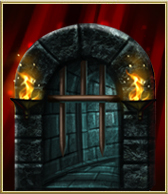 The gate key restores 3 used dungeon points with every activation, until the maximum number has been reached. This cannot be purchased from the Premium tab and only drops from Divine Chest of Faith. Can be 1 or 3 in quantity. 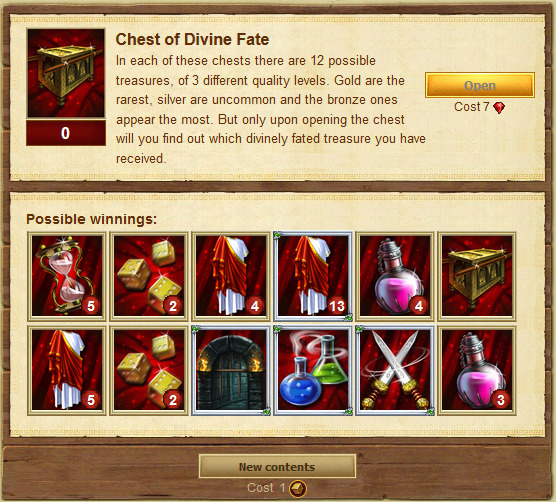 These are the rewards that can be won in the Divine Chest of Fate. Most of these are Premium items and can be found in the Premium tab. Guild is one of the most important aspects of the game. Joining a guild gives you social interaction, reduces cost for training, provides centralized guild storage, guild market, guild chat and you can heal your character in the Guild Medic. Being such a big topic, there will be a Guilds page on this website as a separate big article. 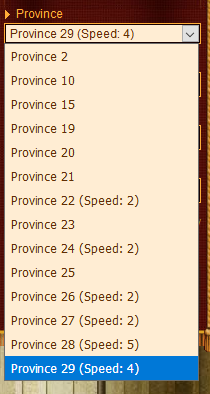 The Highscore tab leads to several sub-tabs where you can check different rankings on this particular province or server. 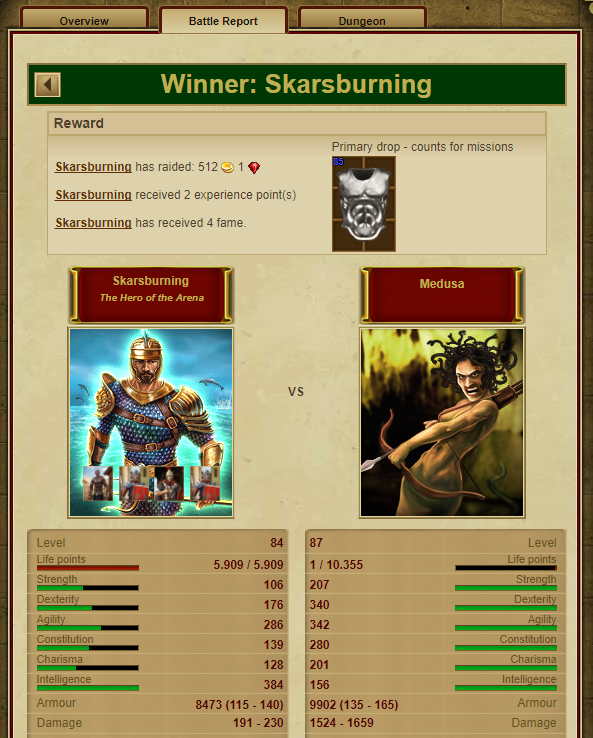 By default the general ranking in Gladiatus refers to the "Player" rank and players in the "Player" ranking are scored and sorted based on their Honour points. There is a button just below the "Player highscore"
Clicking will show you the Highscore rankings as they are but for the last 7 days. This is a good check who is active on the server. Same as Player highscore, the dungeon highscore has a 7 day variant. It all seems not really relevant. 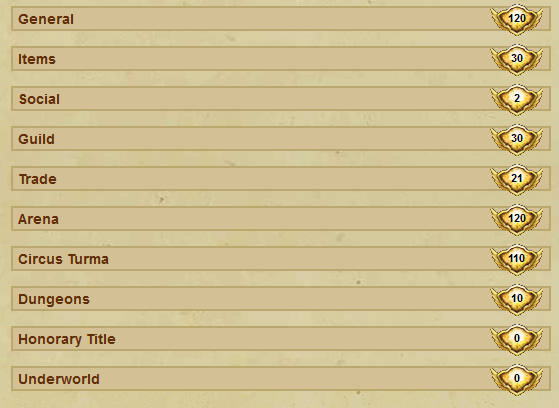 The guilds highscore tab shows the server guild ranking. Just like Player ranking, guild ranking is based on Honour. 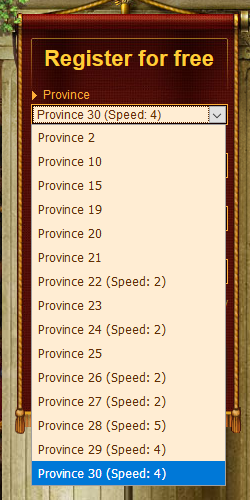 The total amount of Honour from all players in a guild. 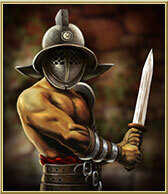 The Recruiting tab is where you can invite new players to join Gladiatus and start playing on this server. If they are invited through the Recruiting system, they will be connected to you and bring you some rewards. Jeweller is where you can buy Rubies and buy Premium items. 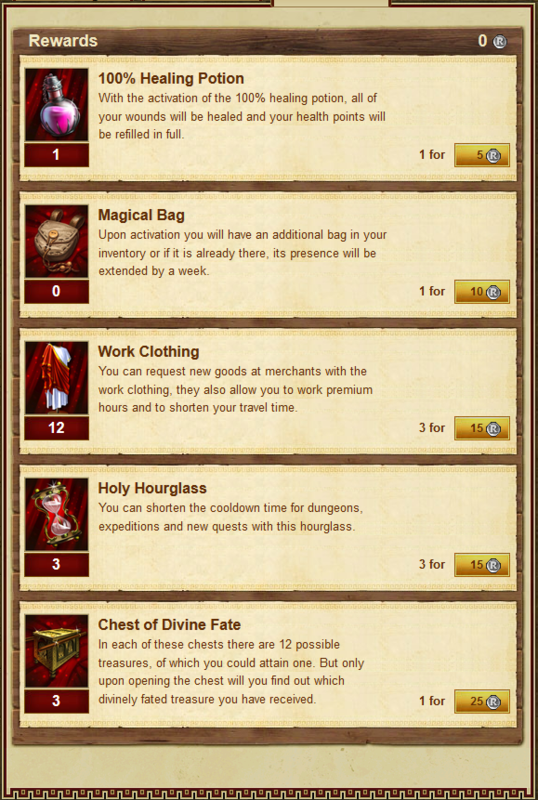 Premium items are described in the Chest of Divine Fate section. From the daily login bonuses. Here is evidence. 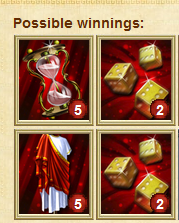 1-2 for a daily bonus and if Rubies are awarded from the bonus weekly it could be 4-6 Rubies. Here is evidence. Where can you spend Rubies? Inventory in the Premium tab shows you different premium items that you posses. This is from where you can activate them too. Pacts is one of the most fundamental premium features of the game. 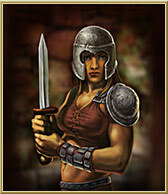 Pacts can be purchased for Rubies or be won at the Divine Chest of Faith for free. There are 4 categories of pacts. 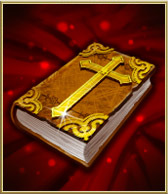 A Pact of each category costs 15 for 14 days or a token that drops from Divine Chest of Faith. You can switch from one pact to another within the same category but it has a 24 hour cooldown. You will become mightier than you ever dreamed of if you choose to make a pact with either the earthly or divine powers! But you will always have to keep in mind that you an only activate one pact from each category. We wouldn`t want the gods to argue about whose favourite you are; this would cause terrible chaos. It increases the items that you can see in Market, Guild Market and Auction House (not wear) with 2 levels. In Market and Guild market this pact allows you to increase the items that you see from +9 above the character level to +11 with this pact. Auction house from +14 to +16. This reduces in half all the vendor cooldowns from 24 hours (on regular servers) to 12 hours. This halves the quest cooldown from the default 30 minutes to 15 minutes. Interesting that with Wrath Mountain Scale Armour costume full set it becomes 6 minutes. Go read more on Costumes. Also reduces the default price the reduce cooldown on quests button from 3 or 3 to just 1. 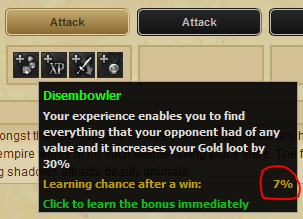 This increases your learning chance for expedition bonuses with 5% on top of what you currently have. If you are entering a new expedition, you might want to turn this on and when you don't need it switch to another pact when the 24 hour cooldown is over. Increases your overall chance to find an item with 15%. This is a really good pact. 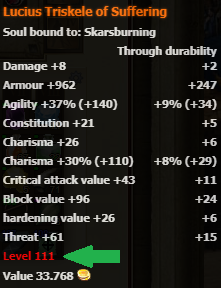 This pact increases your agility by X based on the character level (beyond the maximum stats). Probably the best Secret Knowledge pact. 186 for example is on 94 level. 282 on level 115. You have a number of bags each with 40 slots. 2 are available at start, 3rd unlocks at level 10 and the 4th unlocks are level 20. The rest of the bags are paid, with 1x or 7x for a period of 7 days. Bag VII and VIII are twice more expensive - 14x for 7 days or 2x respectively. Now a little bit about Items in general. More and extensive info on the Items page but we will cover basics here. Items can occupy from 1 to 6 slots in your inventory so you need to manage it correctly and efficiently to hold as much item as possible. An item is formed by a base item + Prefix word + Suffix word. The item level of an item is also formed from the level of the base item + the level of the Prefix + the level of the Suffix. More about Prefixes and Suffixes. Mars (Purple) - This is an upgrade quality over Blue. Stats are 15% better than Blue. Olympus (Red) - Until 2015 the Red item quality only existed in the game code but had never dropped. With the implementation of the Forge in 2015 the Red items came into existence but are so rare that apart from Forging the % drop chance is so low that has not been recorded. Stats are almost twice as better than Green and 15% better than Orange. How rare is each quality? Purple you can expect to see from the very beginning but very very rarely. The drop % chance increases to a more suitable level from Dark Catacombs. In Gladiatus there is a primary and a secondary drop. The Primary drops are your regular drops from a mob like items and secondary drops are items such as Forging goods and Scrolls. You can have a Primary and a Secondary drop simultaneously, in 1 kill as shown above. Secondary drops even work when you lose the battle! Soul bound - Equipping an item makes it Soulbound to your character. This means that if you trade it over to someone else, he will not be able to equip it. You can remove the Soulbound status of an item with an item called Mirror which is a premium item and we will talk more about it in Alchemist vendor section. However, the game doesn't really restrict your in equipping a higher level item. It just tries to restrict the ways of obtaining one. So what happens when you try to equip such an item? Expedition enemy will never drop an item that is more than +16 item levels above your character. Even if this particular expedition enemy can drop a higher item level, it will not drop you such a high item level until you level up and cover the +16 rule. This is a very interesting expedition property. Poisoned Country dungeon. Entry level 35. Character is 35 well equipped and can defeat the boss immediately. The boss item level drop range is 45-54. On Level 35, everything above item level 51 will be in red and unwearable. Here is a direct example with a screenshot. So this seems like an example for exception where the game allows for higher item level drops to drop but it doesn't seem like a big issue because it's only few levels above which is not really that bad. You can see that with some luck and using costumes or Micro events that boost forging success chance, it is possible to forge a higher level item but it's so risky and so unreasonable that it's just not worth it. That's why the game allows for these 2 ways of obtaining a higher than +16 level items but they are left in there just because they are not such a big issue and blend in the game just fine. so when an item is sent to your character as a package, it will stay there for 7 days (more if you use certain costumes). 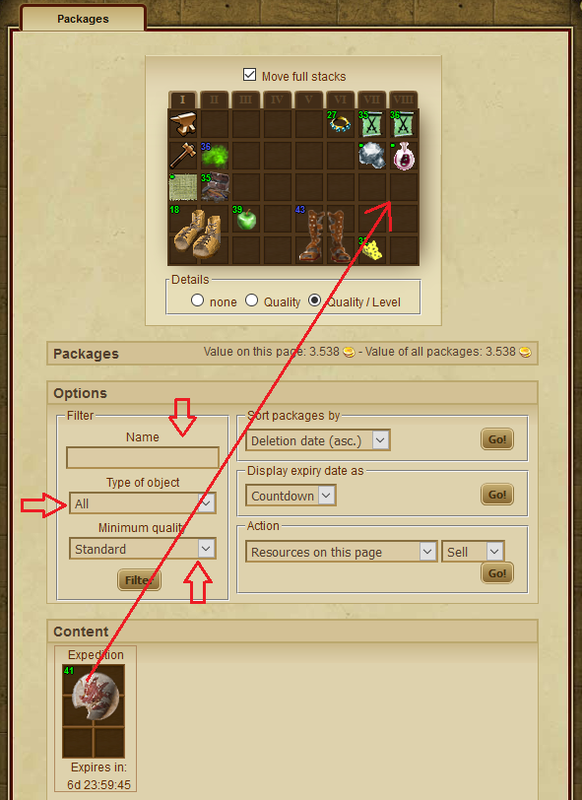 If you want to use it or just store it in your inventory bags, you can drag it out of the packaging interface. As packages can grow large in 7 days, the package interface allows for sorting and searching of your items in your package interface. 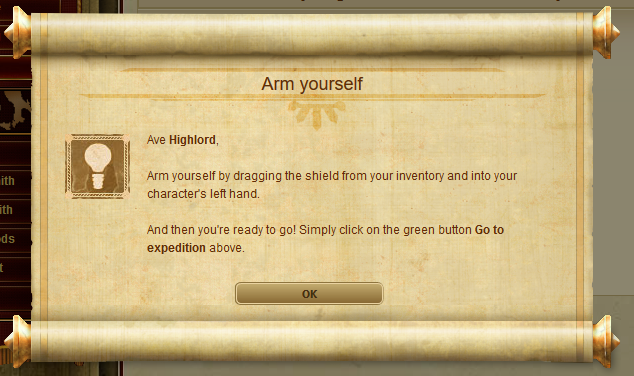 You can search by name, search by type (Armour or gloves or a recipe) and you can set a minimum quality to be shown. For example, if you are looking for these orange materials and you want only orange materials to be shown so you can drag them to your inventory but you don't want any other quality, you can set type of object to Forging goods, then set the minimum quality to Orange and show only orange materials. Package system is often used as additional storage because the bag slots and inventory are just not enough to hold all of your items that you find on your adventures. Just be aware that when a package expires it will "sell" the item for the amount it costs to a vendor in and the will deposit the gold directly to your active gold on the character. This may sound good, at least the item is not deleted, at least you will get the gold worth of and this is indeed very generous but there is a danger of piling up too much gold and be easy prey to attackers. Best to spend the gold as soon as the package expires or just do not let the items expire and sell them to vendors at your convenience. 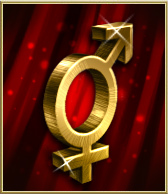 Gold is represented with the icon and is the most essential part of the game. If you want to level up quick, you could use a mix of Blessing pacts and utilize your expeditions to the max, meaning that you should not fight enemies that you lose against. Also after level 100, it is really important which UW (Underworld) costume you use. The best one for leveling is Dis Pater Normal costume. You should also play on events, they are almost always involving an extra expedition which you can fight and in and gain experience. You could also play with Cervisia and other 1 day Centurio items and use them only when below 12 expedition and dungeon points so they can effectively refresh extra points. Also, good advice is not to stay on full points for a long period of time as these are wasted points. 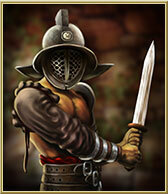 Experience - Participating in a fight, whether it is in Expedition, Dungeon or Arena fights grants experience. You need a certain amount of experience to level up. You can get 1-2 experience even if you lose a fight. Level - You level up when you reach the experience points required for the next level. Read more about it in the Leveling section. Another really important stat is health points. We already mentioned that Health points are closely related to Constitution stat and your character level. When you receive damage, your health drops with the amount of damage you have received. In Gladiatus you can heal yourself by eating food. More you can read more about it on the Food page. 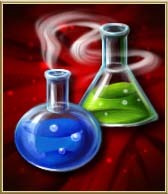 There are other ways to heal yourself, like using the Guild Medic, regenerate health over time just by waiting or using a 100% healing potion. Critical hit - Chance to do 2x damage on your attack. This counts for every attack. You can double hit and the 2 hits you make in 1 round can be critical strikes. Maximum of 50% critical hit chance is allowed (60% with Pact). Your % to land a critical hit depends on your critical attack value from Dexterity and through items. 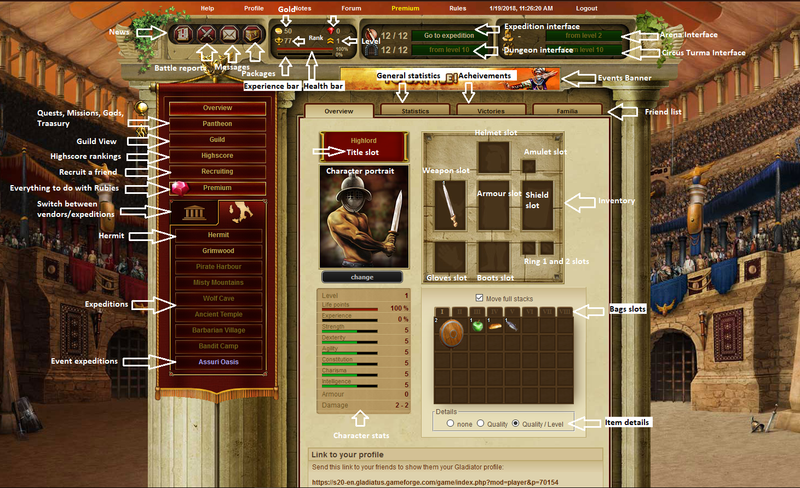 Battles in Gladiatus are based on rounds. When the fight begins, Round 1 starts. In each round, Attacker and Defender are exchanging attacks. The first to attack is always the Defender. The winner is determined by whoever does the most damage in a certain number of rounds or whoever dies (reaches 0 Health points) first. Every round is also based on RNG. Because most of the combat stats are maxed at 50% cap and because chance to hit rarely surpasses 60% the randomness of who hits who successfully in a fight or who lands a critical hit is very big. Therefore it is possible to beat a stronger opponent with "lucky" hits. Of course this cannot happen when the difference in powerful two gladiators are is too vast but on close stats the "luck" can really make a difference. 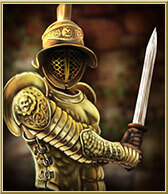 The art of being a successful and good Gladiator is to spend your gold wisely. The only good reasons to spend gold is to train stats and to purchase items from the Auction house or spend gold on buffs. 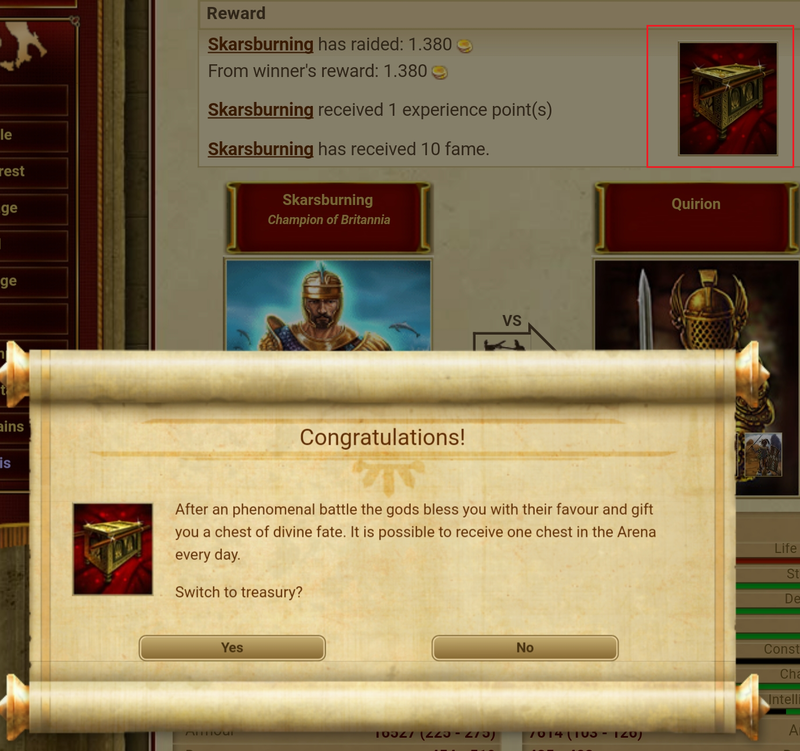 This means that you don't want to be spending gold for unnecessary items, hugely overpriced items in the Auction house, items that you don't really need and can't get value out of them after and last but not least - lose as little gold as you can from Arena attacks. 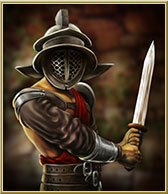 We know that the more gold you hold in your character, the more an Arena attacker will plunder from you. This means that at any time you should be minimizing the gold that you hold in your character. However, this is easier said than done. We said earlier that we shouldn't be spending gold on useless items, or items that cost more to buy then to sell in a vendor later. You might not have enough gold to train a stat in the Training ground and the gold needed for training the stat can be so far away that holding this much gold until you are ready to train can be really reckless and risky. 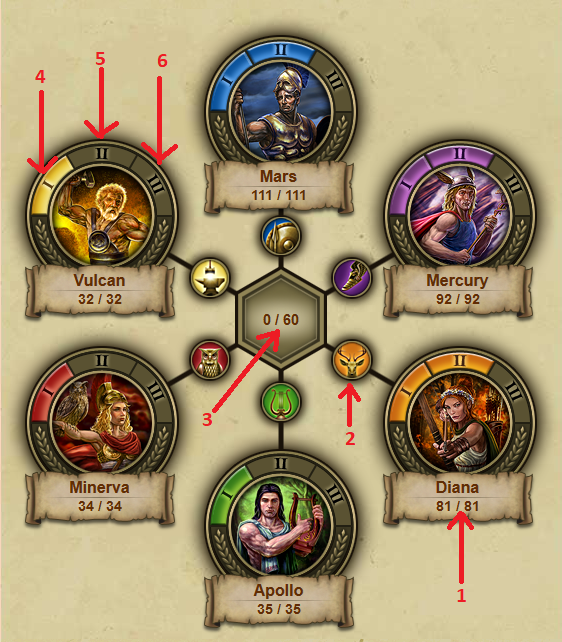 So here are few suggestions on how to rotate gold in and out so you save it for later, while maintaining none or very little gold on your character, being safe from attacks. 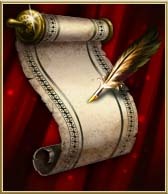 Selling Amulets and Scrolls - Amulets and Scrolls are the two most expensive types of items in Gladiatus. You can use them to your benefit. Save in your inventory bags amulets and forging scrolls that you don't need to use right away. When you amass a certain number of amulets or scrolls, sell some of them (or all) to the vendor, enough to train stat of your choice in the Training grounds. Now you've spent your gold and have the amulets/scrolls in the vendor. You will continue fighting in expeditions, dungeons and arenas and as you win enough gold to buy an amulet, go to the vendor and buy it back. That's how you've spend your gold immediately. Do it again for the rest of the amulets/scrolls in the vendor. When you buy them all back, repeat it all over again. Sell them, train a stat, start buying them one by one so you can stay low on gold and repeat and repeat. 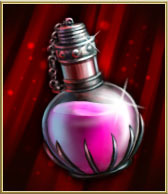 The higher the quality of the amulets, the more they cost. Best to use Blue, Purple and Orange ones. This is the most common form of gold-saving. It becomes harder when you need millions of gold to train 1 point but that's where you can increase the use of scrolls where amulets will become too low on gold value. There are no downsides to this approach. It just might be harder once you reach the stats training costs in millions and you should be on the lookout for vendor cooldowns. You don't want to forget about it and for it to reset while your amulets and scrolls are sold and you haven't bought them back yet. Happened to all of us a number of times of course, but best if you minimize it. Gold re-packaging - Another way of saving gold is through repacking it. For this one however, you need to be in a guild and you need the help of a guild mate. The idea is to make the gold your character holds into a package, where it can stay in the Packaging system for at least 7 days, safe from all harm. So how does it work. You are Player 1 and the guild mate will be called Player 2. Let's say you have 1 million gold that you want to package. You will write a guild message asking "Please can someone pack 1 mil gold for me". Player 2 is online and would like to help. He will then pick one item out of his inventory and will place it in the Guild Market. Player 2 needs to be aware of the Market view limitations and not to put item that is too high level for you to see. Best if forging goods are used, they have no item level and are considered to be Level 1 when it comes to Market. So you are asking for 1 million gold. 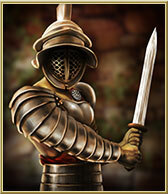 He will put the material in the Guild Market and will place a cost for it of 1 million gold. However, the Guild Market has 2% fee for placing a 2 hour sell. On 1 million gold this is 20000 in fee. Why should he pay for it, when is the one doing you a favor, he could ask, and he would be right. Different guilds have different rules. Some people don't care about the fee but some might do. If you want to be on the safe side, you could just say that you want the fee to be included so you can cover the cost of the Player 2 doing the repacking for you. You just might want to make it clear that you want the fee to be included on the first message asking for the re-pack by saying "Please can someone pack 1 mil gold + fee for me". Let's get back to Player 2 preparing the material for selling. If no fee is included, he would place the material at exactly 1 mil gold for you to buy. If fee is included, he will add it on the initial placing of the material. Instead of 1.000.000 gold he will put it for 1.020.000 gold. Once published in the Market, it's now your turn to either buy it immediately (if you have the gold ready) or start amassing the gold by selling items and stuff. Once you are ready (try not to be too slow about it, as the other player is waiting for you) buy the material placed by Player 2. Now, your gold is with him and his material is with you. Take your material sold by Player 2 in your inventory and place it on the Guild Market. Place it for 1.000.000 gold. You will pay fee again. Player 2 will take the gold from the 1st purchase and buy the material you placed the 2nd time, thus you receiving 1 mil gold for it and he gets his material back. Now, you have 1 million gold packed into a package safe from attacks. The cost of doing this is: involving another player + 2x times 2% fee. in our case packaging 1 million gold, you will have to pay 40k in fees. This is the most used method for safeguarding larger amounts of gold and is the most common form of gold saving used out there. You can use both 1 and 2 suggestions at the same time. 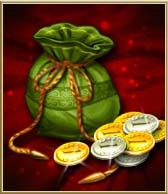 For small summs and everyday use you can use the amulets and scrolls and for larger summs you can use Gold re-packaging. Play like a pro - In this section we will discuss how the pro players play the game. This is certainly not the necessary way that YOU need to play as this one involves being online very very often and have a good and supporting guild and also would investing real life money. Training stats - if you want to train like a pro, you need to do in the most efficient way. All stats are important and should be trained with the exception of maybe Strength. Strength you can leave to natural growth through levels. It's just that Strength is not as beneficial as the other stats. 10 Strength will grant you only 1 damage and only 1 block rating. Everything else should be trained and not be ignored. Dexterity is arguably your best stat you might want to train it harder than the other. On the other hand it is expensive. Agility is also a very important stat and is cheap to train. Intelligence and Charisma are important too. You could either keep them trained the same, have them equalized or equalize them in their cost for gold or just prioritize Agility and Dexterity and train them harder and when they become unbearably expensive, turn to Charisma and Intelligence too. This doesn't mean that you should ignore them. When we say prioritize, you could do something like train 2 points of Agility and Dexterity and 1 point Charisma and Intelligence per cycle. 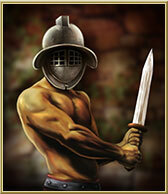 Training efficiently - Pro players in Gladiatus always tend to train for the lowest possible cost. To be a pro and train like a pro, find a guild that has high level of Training Grounds. A Level 20 Training Grounds will reduce training costs by 40%. Do not overspend on training when there are no training cost reduction buffs. Pro players will sometime re-package gold and re-package it again until a costume event comes along where they can put on an event costume which reduces training cost with another -20%. Then they will use all the re-packed and re-packed gold all at once and train insane amounts of stats in one go. Gear - No matter how trained you are, you also need good items. 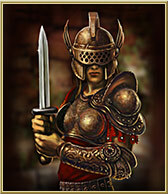 Good items in lower levels will come mainly from your adventures and Auction house. 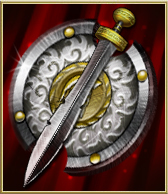 However, if you are in a good guild (you will be, you are a pro) you can ask a high level character in your guild to craft a weapon or another good piece of equipment for you that will be in your usable range. Example: He can craft you a Purple/Orange or with more luck even Red Gaius weapon that you can wear on level as low as 75. Imagine how a 300 damage weapon will transform your play on level 75 or 80. On high levels, like 90 or 100+ they will need to start forging your own gear and get help with high quality orange/red materials from your guild mates so you can start forging your own good Lucius and Gaius/Antonius gear. Pro players wear Orange/Red items and are hardly beatable in their level range, especially grouped with efficient high training stats. 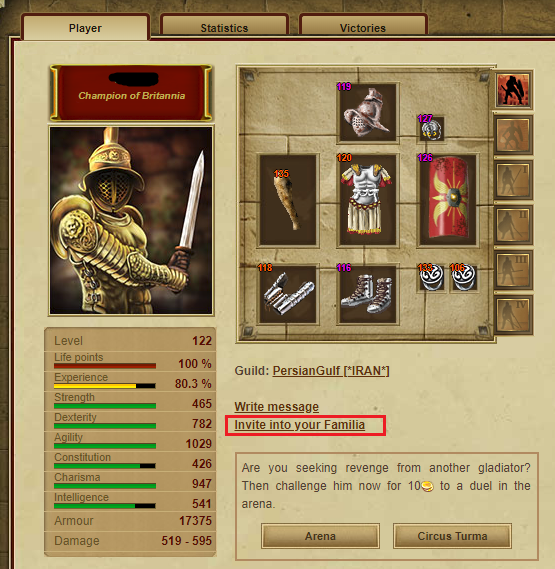 Being good geared and godly trained means that they beat a lot of Gladiators in Arena and Cirucs. Gold that can be plundered from other players should not be underestimated. It can be millions, especially with the Hard Underworld costume. 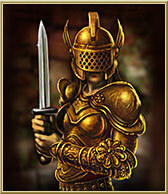 Smart spending gold - One of the requirements to be pro, as we mentioned, is to spend gold only in an efficient way. What does that mean? 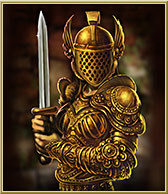 Yes, most of the gold is spent on training but there is significant gold wasted on, especially on low, mid and early high levels for various items or mercenary and for equipping all of your characters. One good advice is not to spend gold on buffs that you know you will replace easily, not to buy Auction House items that are 2x overpriced compared to vendor price (unless necessary, of course we are not skipping this awesome weapon or Mercenary, just because it is 2x vendor value) and not to go into stupid bidding wars with other players in the Auction House. Be Active - that goes without saying. You need to be very active. You should avoid having your cooldowns stay full. Don't let your Expedition points stay full. Same goes for Expedition points and your Underworld cooldowns. Being efficient doesn't mean you have to be a robot who stays online 24/7. If you play it smart, you could have breaks. Worst, mathematically speaking, is to have full cooldowns. Spend your God's favors on cooldown, Do not let your efficient packs such as Blessing pacts run out without noticing. Take rests from the game but just don't do it when full on expedition/dungeon/underworld points. Play on game events. There are at least 2 major events every month. Don't stay offline exactly for the events. They are always related to good buffs or extra expeditions that can bring you training cost reductions or a lot more to fight and farm gold and items from. Do small things like, exhausting all your expedition points before activating Dis Pater Normal costume. 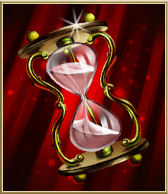 Watch your Centurio run out date and time and use Cervisia or other Centio +1 day boosts to maximize your Expedition points. Do not let Centurio expire when you are on full points as when you active you are not getting as much refunded. These things might feel like small or irrelevant in the bigger picture but they are not! They are huge long-term. 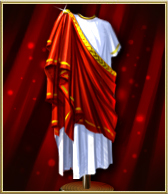 Hermit is an important character in Gladiatus. A very arduous, small pathway leads you into the top of the nebulous mountains. At this remote place a hermit has his home, a man of wisdom and mystery. They say he lives here because he is able to hear the voices of the gods here. In a small cave, not far from the mountain top, sits a small and ragged man. Somehow you had imagined the hermit to be more impressive. 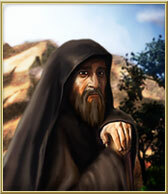 So what is the Hermit's purpose? Traveling between Countries (Italy, Africa, Germania and Britannia) for a cost of . Prices you can see on the Expeditions page. Your current honour isn`t enough for you? You want to be praised in other countries? To be able to enter the underworld you will first have to prove yourself in this world. 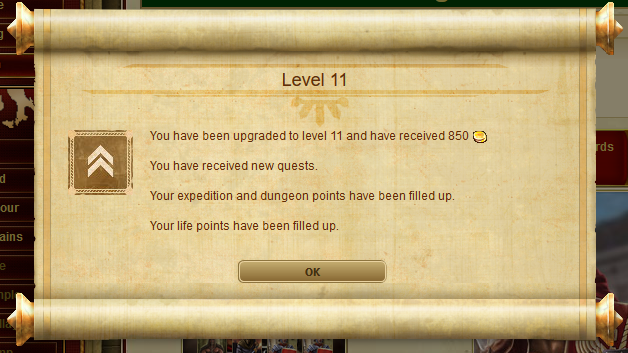 (If you are below Level 100) - Come back to me once you have reached level 100. Hihi. You want to make history with a more powerful name? Your documents are changed against a small charge. Thereby you loose some of your high profile. Your documents are being faked. You`re unhappy and don`t feel comfortable in your own skin? How about transforming your soul into another body? This will be a very basic guide on what Expeditions are. If you are looking for particular expedition opponents and info on them, check out the big Expeditions page. Expeditions are the most essential part of the game. Expeditions are "areas' in the country that you can fight in and unlock at a certain level. 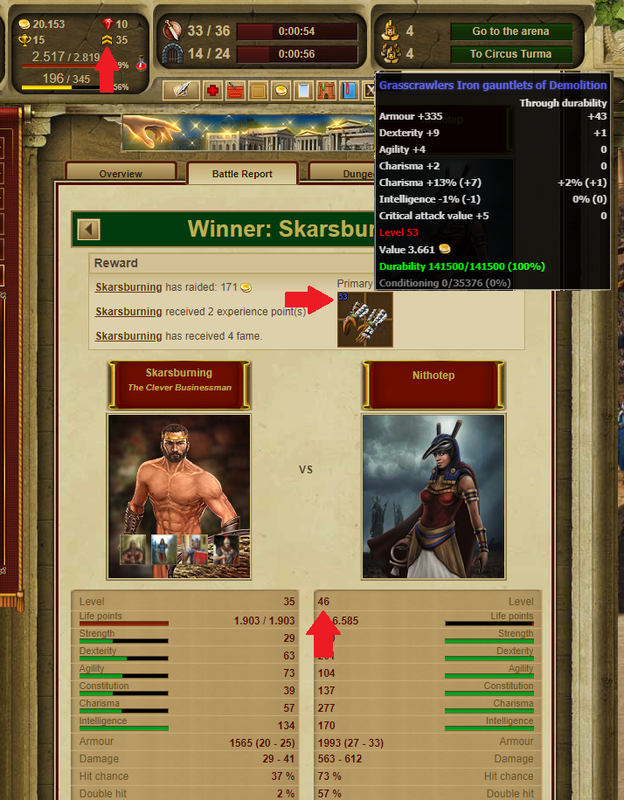 Fighting in an expedition costs expedition points - . 1 Attack against and expedition opponent costs 1 . The normal amount of expedition points you have is 12. If you are using Centurio they become 24. With certain Micro Events or Dis Pater Normal Costume they can increase even further. 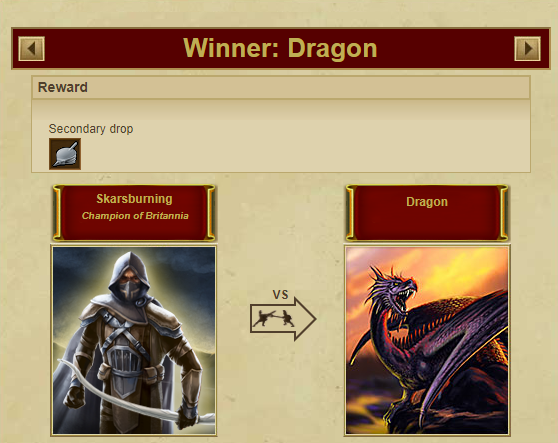 Attacking an opponent and spending an expedition point triggers a cooldown. The default cooldown is 10 minutes, with Centurio 5 minutes and different Micro Events or Costume can decrease this cooldown even further. If you don't want to wait for the cooldown and you want to attack immediately, you can do so but it will cost you 1x or 1x . If you have it will always take precedence over . Only when you defeat the opponent, the others will be unveiled. Every expedition is comprised of 4 opponents. 1-3 are normal opponents where 1 is the weakest, 2nd one is harder and the 3rd one is very hard. The 4th opponent is a Boss and you can recognize him with his special portrait. He is very very hard. Especially when fighting the expedition on its level range. However, at first you will know very little about the opponent and you will have to learn it by fighting the opponent more and more. However, this info is not very specific and will not give you exact details of the stats of the opponent. 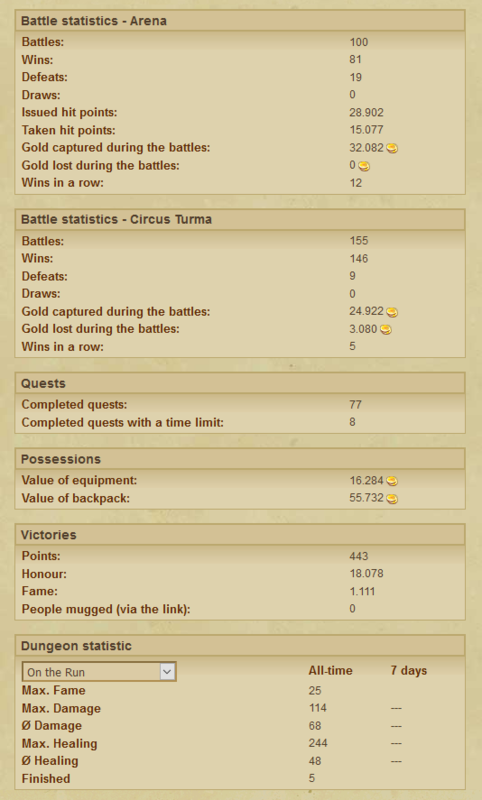 You can see this on the Expeditions page where I have a lot more info on expeditions in general. Have in mind that Event expeditions and Underworld are also types of expeditions and the same rules apply there. More info on their respective sections and pages. So when you engage an expedition opponent you will be fighting him for 20 rounds or until someone dies (gets to 0 health points). In case nobody dies in these 20 rounds, the winner will be the one who did most damage in these 20 rounds. So once you level up to 10, you will notice that there is a second character you can control. This is called the Dungeon character. He is just like your main character, should be equipped with items, can receive buffs. However, he doesn't need training as he will clone the stats of your main character. This means that if you have a pact boosting your stats, the dungeon character will receive them too. 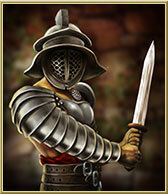 The dungeon character will only play part in your Dungeon and Arena Circus fights. He will not take any part in Expeditions or Arena fights so he will not have any need for healing. We said that going into a Dungeon or a Circus Turma fight, the group will be of 5 characters. This is your dungeon character + 4 Mercenary that you can equip. 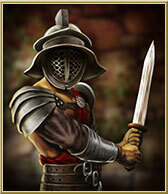 Everything you need to know about the Mercenary types you can read on the Mercenary page. 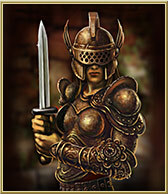 Mercenary can be purchased from the Mercenary vendor or the Auction House. They don't drop from expeditions or dungeons. 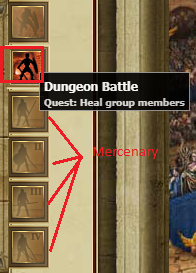 Once the slot is populated with a Mercenary, another character tab will appear. Click it and you will see the stats of the Mercenary and open the character inventory. Just like any other character all 4 Mercenary need to be fully equipped with items. So essentially in total you need to take care of the gear of 6 characters. Main Character + Dungeon Character + 4 NPCs. A party of 5 in any game is usually comprised of a Tank who will soak up damage, a healer who will heal the wounded characters and 3 damage dealers. All 5 dungeon characters, your dungeon char + the 4 Mercenary each has this function control. It can be found on the right upper side of the character inventory and it is there for the dungeon character or any of the 4 Mercenary. What it basically does is it sets what this NPC will do in a dungeon fight. Tank, Heal or do damage. If there is no Dungeon tab - it means that there is no dungeon in this expedition. For a complete list of dungeons check out the big Dungeons page. 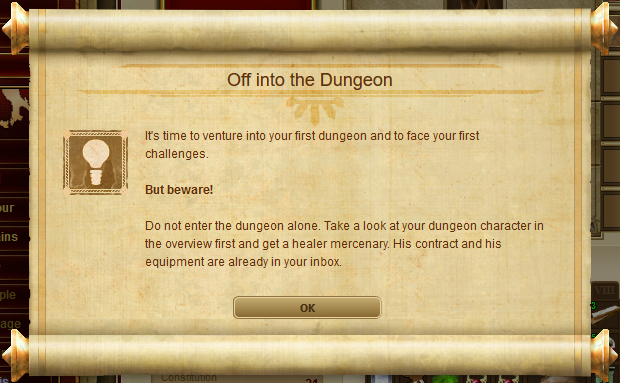 So once you click the Dungeon tab you will be presented with the options to enter the dungeon. 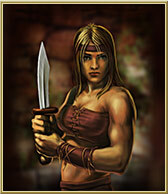 Dungeons just like expeditions are based on attacks costing dungeon points - . 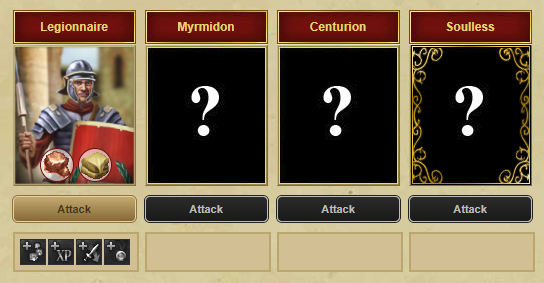 Attacks are made on the current active dungeon minion and you can attack by clicking the . Same as expeditions, 12 points by default, 24 with Centurio and 48 with Dis Pater Medium costume. However, they regenerate slower than expedition points. Once every 1h 30 min without Centurio. 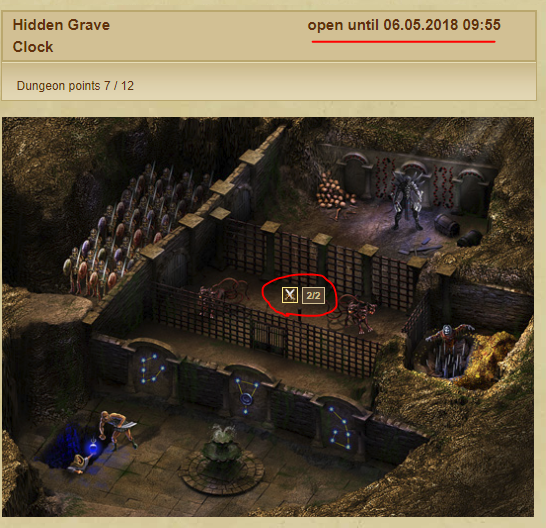 Good to note that dungeons have timers to complete them. 48 hours (2 days) and if you don't complete it by then it will be reset to its beginning. The cooldown, same as expeditions is 5 minutes and can be lowered by Micro Events or costumes. If you want to skip the cooldown immediately, it cots 1x or 1x . If you have it will always take precedence over . You can also cancel a dungeon and start from the beginning whenever you want by clicking the Cancel dungeon button. Good use of the cancel button is where you are not strong enough to defeat the boss but you have already defeated the minions and there is nothing other than the boss to fight. In that case you can fight up to the boss and cancel dungeon to re-enter and that way you will be at least farming the minions for higher items instead of going back to a previous dungeon where you know you can complete it. So once you start the dungeon you will be fighting dungeon minions and the end game is to kill the dungeon boss. The dungeon boss is a lot harder than the minions but his rewards are quite awesome. 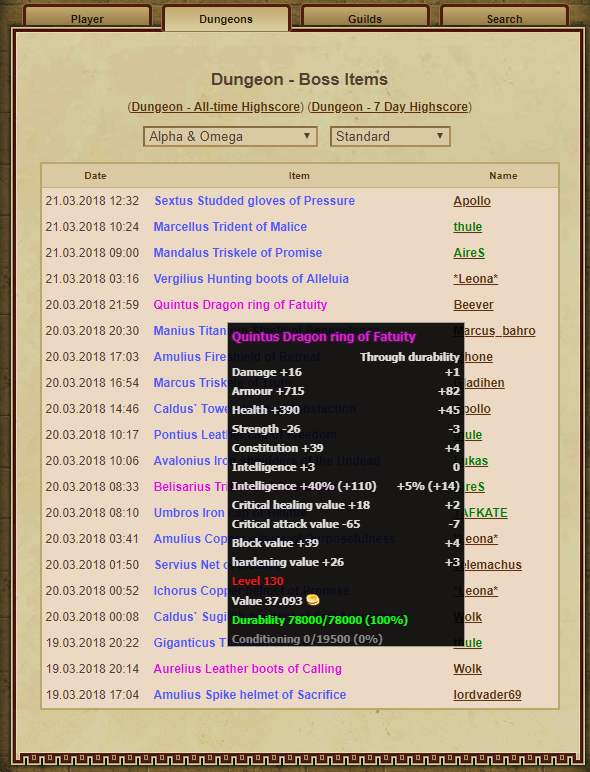 He always drops an item (100% chance) and this item is always at least of Blue quality. To get to the boss you have to complete the dungeon quests. Dungeon quests are mostly concerned with just killing the minions but sometimes they are connected to finding an item to proceed ahead or just defeat some of the minions. 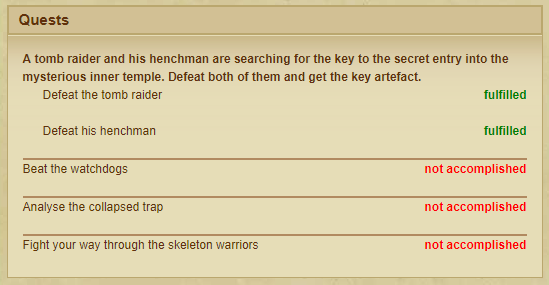 Here is an example of quests in the Hidden Grave dungeon. Dungeon minions and boss reward very few experience points and gold even on high levels. 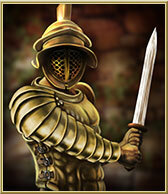 A dungeon opponent win will grant you gold, experience and instead of Honour - Fame. 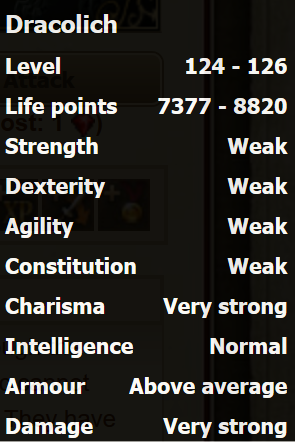 Fame is a stat that we talked about in the Character stats section of this page. So for more info on the Dungeons go to the Dungeons page.